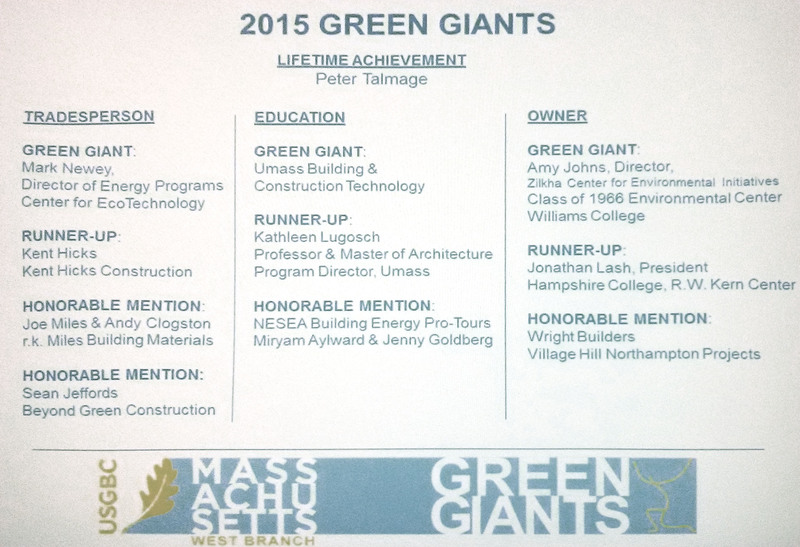 Home > BCT Program Wins 2015 USGBC West Branch “Green Giants” Award! 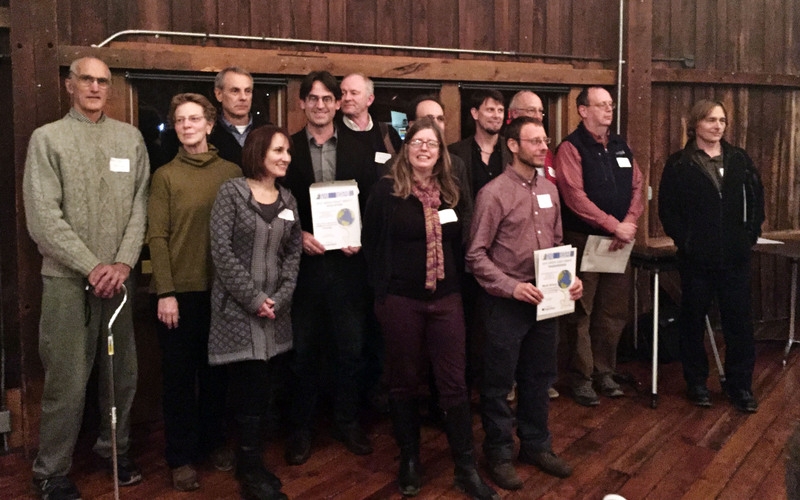 The UMass Amherst Building and Construction Technology program was honored on December 1st, 2015 at a joint WMAIA/USGBC event at Hampshire College for our efforts in educating future leaders in green building and sustainability. Program director Alexander Schreyer and Associate Professor Peggi Clouston accepted the award on behalf of the BCT program. 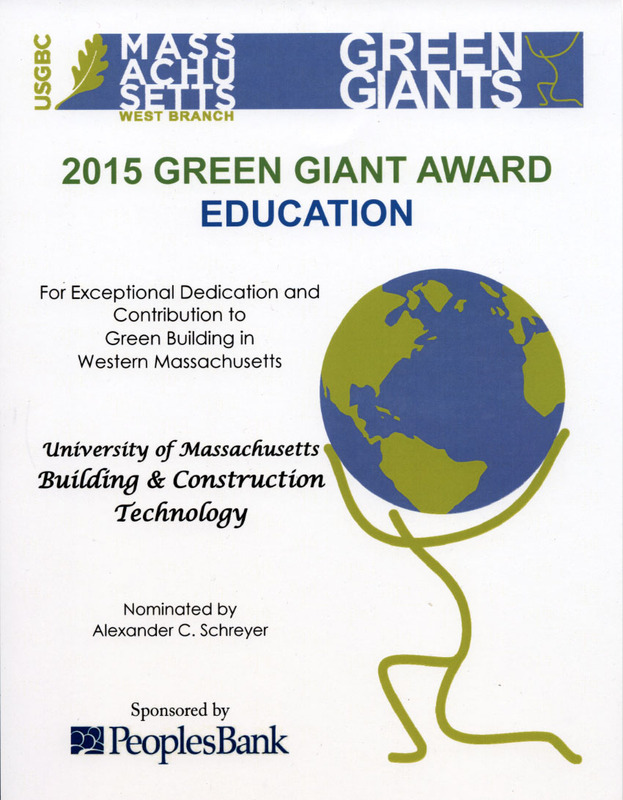 The Green Giants program honors the work of trades people, educators, and owners/program directors who help build, teach about, envision and fund green buildings in Hampshire, Hampden, Franklin, and Berkshire counties. This program is intentionally distinct from other building awards in that it honors a wider range of participants in the sustainable building industry of our region. This is the second year of the West Branch Biannual Green Giants Awards program. This award reflects the amazing work of our faculty, adjunct faculty, and our student groups. They are all engaged on a daily basis in teaching (and learning) about sustainable materials, systems, and processes, and in conducting ground-breaking research in the many topics that constitute sustainable building and sustainability in the built environment. Congratulations to all of them! More information about USGBC’s West Branch and updates on this award can be found here. We also have a USGBC student chapter whose website is here.